Willie Ruff, the French horn player and double bassist, enjoyed a celebrated musical partnership with the pianist Dwike Mitchell that, over more than half a century, took him to stages around the world, from the segregated South to Communist China to Town Hall in Manhattan. It was a long and winding road that ended with Mr. Mitchell’s death in April 2013. Since then, Mr. Ruff, 83, said, he has been on a hiatus from playing in public. Aside from that, however, he has not slowed down much. 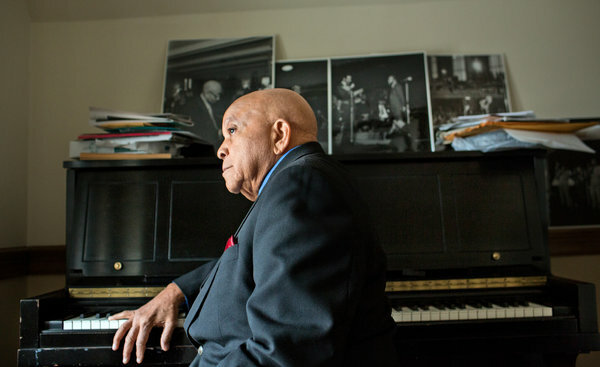 Sitting in his small studio at the Yale School of Music, where as a faculty member he has been a kind of emissary from the jazz world for four decades, Mr. Ruff spoke recently about projects he is pursuing and loose ends he wants to tie up. On March 6, he hosts the pianist Aaron Diehl at Yale’s Morse Recital Hall as part of the Ellington Jazz Series, which has its roots in a notable gathering of jazz masters organized by Mr. Ruff in 1972. Booking Mr. Diehl for it will, in addition to bringing a new star to the Yale campus, pay homage of sorts to one of Mr. Ruff’s old Army buddies, who happens to be Mr. Diehl’s grandfather. For Mr. Ruff, nearly all roads lead back to the Army, where, as a post-World War II recruit from Sheffield, Ala., he picked up the French horn, which he learned well enough to be admitted to Yale. After graduating in 1955, he went to California, found work as a musician and developed a jazz history course at U.C.L.A. That course provided something of a model when, in 1971, he presented the idea for the convocation to Yale officials. “It’s time Yale acknowledged the contribution of African-American music,” he recalled telling the officials, who agreed. What they did not agree to, however, was providing money for the event, which he eventually found in the form of a grant from the grandson of the financier Paul Mellon. As large photos on the walls of Mr. Ruff’s studio attest, the convocation attracted about 40 leading lights of jazz, among them Duke Ellington, Dizzy Gillespie and the bassists Charles Mingus and Slam Stewart, whose weathered bass leaned against a wall of the studio near the photos. With its deeply researched presentations and personal encounters complementing the musical offerings, the convocation “set a formulation for an exchange of information and probing discussion about issues that relate to the music,” Robert Blocker, dean of the Yale School of Music, said in February. Ultimately, the event gave rise to the Ellington series, which remains the major jazz offering in the school’s roster of regular concert series. “It established the instrumentality that has allowed me to keep the series going for 42 years,” Mr. Ruff said. Over the years, Mr. Ruff has known many of the artists he has booked. But the scheduling of Mr. Diehl will lend the proceedings another kind of personal dimension. Mr. Diehl is the grandson of Arthur Baskerville, a trombonist of some renown in Columbus, Ohio, whom Mr. Ruff grew close to as a teenage soldier at Lockbourne Air Force Base (now Rickenbacker Air National Guard Base) near Columbus.